You know those strange/annoying/unbelievable offers on Twitter that claim they’ll enter you into a contest if you retweet? 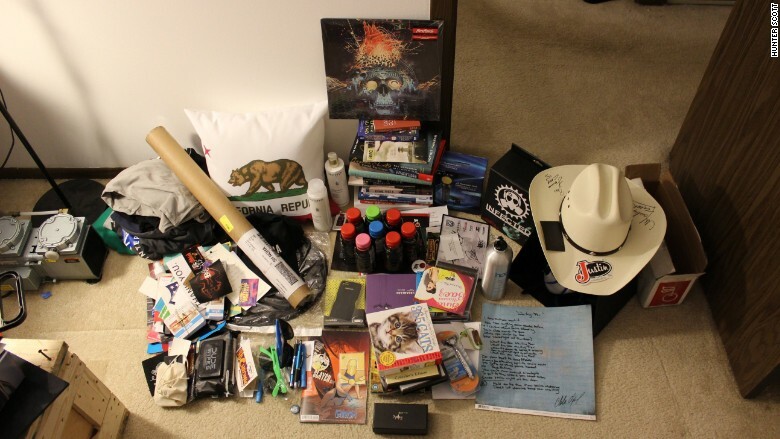 One guy built a robot that won nearly 1,000 of those contests in nine months. Hunter Scott, a twenty-something electrical engineer at Motorola Solutions (MSI), claims to have won dozens of gift cards, a whole bunch of movie and concert tickets, a Kentucky Derby mousepad, a Godzilla hat (and shirt), a year of free Spotify, and a ridiculous number of customized images for gaming and YouTube profiles. In a blog post on Medium, Scott acknowledged that his winnings were mostly crap. “I won a lot of cool stuff too though, and getting mysterious things in my mailbox each day was pretty fun,” Scott wrote, though he noted that the novelty eventually fizzled. Using the Python programming language, Scott built a tool that finds tweets that say something like, “RT to win.” Then, the tool retweets those tweets. In many cases, you have to follow the person or company advertising the contest to win, so the robot Scott built would do that too. It sounds simple, but Scott said it was more difficult than it seems. He had to hide from Twitter’s(TWTR, Tech30) censors, which ban robots from the social network. It also bans accounts with fewer than a couple hundred followers from following more than 2,000 people. To slip under the radar, Scott said he programmed the robot to follow exactly 2,000 accounts. Scott said he turned down many of his winnings, since they were to events, concerts or movies that he couldn’t attend. (He managed to go to just one event that he won tickets to). He also turned down his most valuable prize — a limo ride and shopping spree during New York Fashion Week worth $4,000. He said he couldn’t go because he lives in Illinois, and he didn’t want to pay the taxes on the prize. When he didn’t claim the prize, he ended up messaging the contest planner back, telling them to give the prize to someone else. “And before you report me to the IRS, yes, I reported and paid taxes on all of the winnings I actually accepted/received,” Scott said. What was the best thing he won?